Good cast right? I don’t usually go this long with listing cast members, but this was a first-rate cast assembled for a first-rate legal thriller. All of them kept up their end of the bargain. However, the Lincoln in the title could have fit between the holes in the plot, holes I doubt were in the novel. I really wish Connelly would get the kind of treatment Lehane got in Mystic River or Gone Baby Gone. Instead he gets another Blood Work. 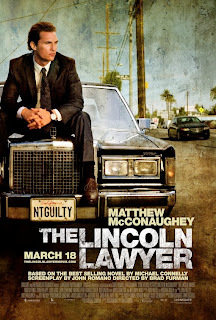 PLOT: Mickey Haller (McConaughy) runs his practice from the back seat of his Lincoln. It’s mostly the down and dirty defenses you’d expect. He has two ex-wives (although I didn’t realize the second one was a wife until later) and a daughter. 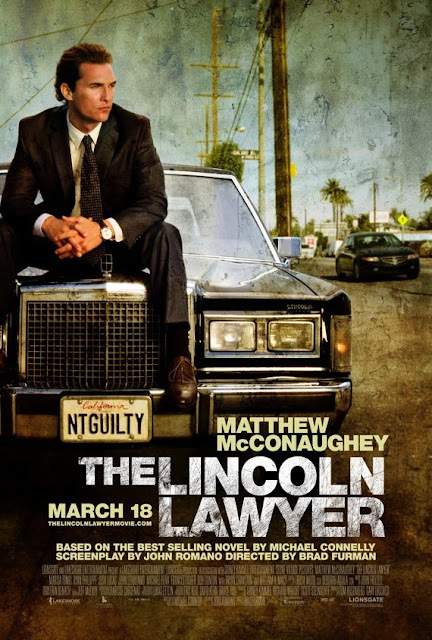 His Lincoln is driven by an ex-client who owes him money. A motorcycle gang, also in debt to him, acts as enforcers when the case calls for it. One day, a well-heeled client, Louis Roulet, (Phillippe) asks for his services. A woman has been beaten and nearly murdered and fingers Roulet as the perp. Why does this rich kid choose a lawyer practicing from a backseat instead of a swanky Beverly Hills office? The story rests on this question. The woman’s face resembles the face of a woman beaten earlier. Links to a former case of Haller’s, one he mishandled, arise. The story becomes garbled early on (was there too much plot for a movie to be coherent or is the director too much a novice?) and we’re expected to find a case about a guy who beat up a woman, and maybe did it before, interesting enough to sustain us. I never really got a clear idea of what the client was up to. Nor his mother. When she turns up in Haller’s apartment near the end, we can’t really identify her with much of anything. With TV shows like JUSTIFIED, BREAKING BAD, THE KILLING and THE GOOD WIFE, putting out complex stories with complicated characters week after week, this movie seems dated. Several characters have so little to do you wonder why they didn’t cut them (Macy, Fisher, Lucas.) The attempt to elbow in a romance with his ex-wife here also seems forced. Yes, they still love each other; no, they don’t. This is not a terrible movie if you don’t expect to follow every plot strand to its conclusion. The acting, music and ambiance work well. And perhaps if you go to having read the book, it will all come together. my god I totally loved the breaking bad new season premier last night. Now I cannot wait until next week, talk about leaving on the cliffhanger. its quite likely the best show on TV this year! What do you think is gonna happen in next sunday’s episode? I greatly appreciate this movie. It was really awesome like the novel that I have read. It emphasizes the story and life of certain folks. I will be expecting it's new series if ever there is. The movie did an admirable job adapting the novel – hinting at all the same elements that are hinted at in the book. The only significant change – Haller has two ex-wives! I will book a ticket and go to theatres. While I do most of watching at home, there is still something special about being a full-sized movie theater. And I can only watch them at the movie theaters. At home my attention is too fractured. I don't get to the movies much. I prefer to wait till it comes out on vidio and watch at home. Much more comfortable that way.